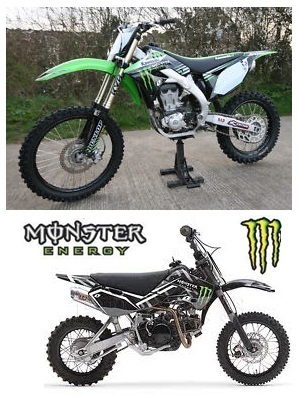 monster pit bike action from low cost to high price motorcyles. Life on the Edge: The Monster Pit Bike. Not long ago the word monster brought images of frightening creatures from Grimm's Fairy Tales and visions of Frankenstein. It gained a new meaning as it became identified with a wide variety of sports events, such as racing and boxing. 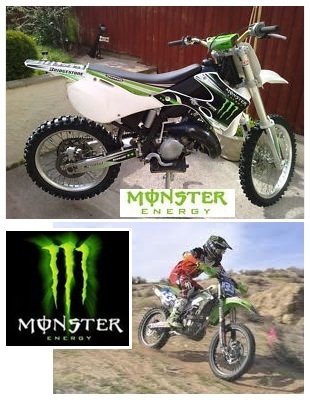 Monster pitbike events benefit from the publicity and branding given by the Monster Energy Drink name and fame. The Monster Army lives life on the edge and anyone can join the team. Both fans and athletes represent the brand around the world. Instead of spending money to plaster their name on billboards and airwaves, Monster supports the sports scene and fans by bringing concerts to local communities, hosting parties and providing opportunities to meet athletes and see them perform. They provide backing for worthy athletes and tie up with companies demonstrating similar goals. The Monster Energy/Pro Circuit/Kawasaki team includes riders that enjoy riding their KX250Fs to victory and earning a spot on the podium. Pro Circuit riders include Broc Tickle, who moved up to a 450F this year and Blake Baggett with the 250F. So what makes a Monster pit bike? 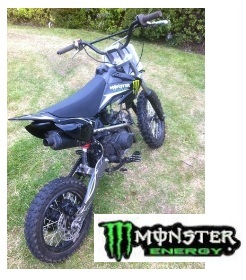 Orion Pit Bike Sales, for one, with a collectors edition OPBS X5R-125 Monster Energy Supercross Replica. The CARB-approved bike has a lifetime frame warranty and has a price of $1299. An extra $199 covers assembly and the first oil change. Monster graphics are included, with the exception of plate graphics. If placing decals on bike parts is one of your biggest nightmares, $49 will result in the graphics being installed professionally. Features include a high strength steel frame, an aluminum swing arm, a kick start, a manual transmission and a 125cc 4-stroke single cylinder air cooled engine. Proud of their logo, Monster encourages fans to display it on shirts, backpacks, trucks and windows. They help fans by promoting reduced tickets to sports events such as pit bike racing, and by giving away helmets and dirt bikes. Monster pit bike sponsorship at charity events helps community members join in with the company that they may never have met otherwise - and makes good things happen. Show those decals with pride. Mx pit bikes on a budget - the 110cc pit bike. A monster pit bike - Pitbikes for Everyone. There are many kinds of pit bikes, and each of them is designed to accommodate a different type of rider. You may want a small pit bike, a large pit bike, a monster pit bike, a heavy pit bike, a light pit bike, one with a 600cc engine or one with a 160cc engine. When looking around for your pitbike, you should think about what you want before you make your final decision. If you are an amateur, you should consult a professional when looking for a bike for you. You can easily obtain information online or you can visit your local pit bike store and talk to the salespeople. If you are looking for an economical pit bike, the one that you want to consider is the Akuma Assassin 110cc pit bike. The bike is manufactured using parts from large name brands, including Lifan's bulletproof engine and the Mikuni Carb. These bikes are fairly economical, and they are a great starter bike for anyone looking to get into dirt or pit bike racing. The 110cc engine provides sufficient power to provide speed, but not too much power to overwhelm a new racer. The frame is designed from solid steel that can absorb some damage, and is built for medium sized adults and young people. If you are looking for a good quality bike but your funds are limited, the Akuma Assassin 110cc Pit Bike should head up the top of your list. Ride em’ just like the MONSTER guys. If you have a bit of experience with pit bikes under your belt, you may want to consider spending a bit more money than you did on your starter bike. The Monster Moto FK1 pit bike is designed for those with a bit of experience, and this Monster pit bike is designed for easy handling and maneuverability. The handling of the bike is the best in its range of mid-priced pit bikes, and the 125cc engine packs a powerful punch when gunned to full throttle. This is a bike that will last you a good few years if you handle it right, and you can be sure that your bike will be reliable as long as you take good care of it. When searching for a mid-priced bike, this Monster pit bike will be sure to come through for you and provide you with the quality ride that you deserve. Designed to look sharp and handle even more sharply, the Monster Moto SX F Pro pit bike is one of the best high end bikes. The Monster pit bike is designed for smooth running, sharp turning, and comfort. The Monster pitbike is decked out with the best front forks around, and the monster pit bike frame is lightweight and streamlined. You can get the standard 140cc engine, or you can get the factory tuned 160cc engine to provide you with an extra kick. For a quality ride at a price well worth the cost, this Monster pit bike is the best of its class.